These images are BIG and unambiguously heroic; a dead baby quail on a string is not. But that’s precisely the image Art Below founder Ben Moore selected to represent the Resurrection in the 2014 “Stations of the Cross” exhibition at St. Marylebone’s Parish Church in London: Small Still Birth by taxidermist Polly Morgan. Morgan is known for her artistic use of dead animals; they are the raw materials of her conceptual “sculptures”. In Small Still Birth, life and death commingle as a quail chick dangles limply from the string of a red balloon inside a bell jar. This image is not glorious in a grand way, nor does it have the feel of conquest that most Resurrection images do, but nevertheless it suggests—gently—a rising from death. On an episode of the BBC documentary series What Do Artists Do All Day?, Morgan said she intended for the balloon to be evocative of a womb and the string of an umbilical cord. The title of the work suggests a baby born dead—but the letter spacing in “still birth” opens up another possibility: what if this “small stillbirth” is actually a “small, still birth”, the early stirrings, barely perceptible at first, of a corpse coming to life, of spirit (re)filling flesh? The balloon is what gives this piece its hopeful tone, for it is the nature of balloons to rise. Not only that, but as a popular party decoration the balloon alludes to the joy and celebration of Easter. Just as the balloon lifts up the little bird from death, so too did the Resurrection pull Jesus up into new, transfigured life. For him, tomb became womb, a nest of ripening, from which he emerged three days later, born anew. 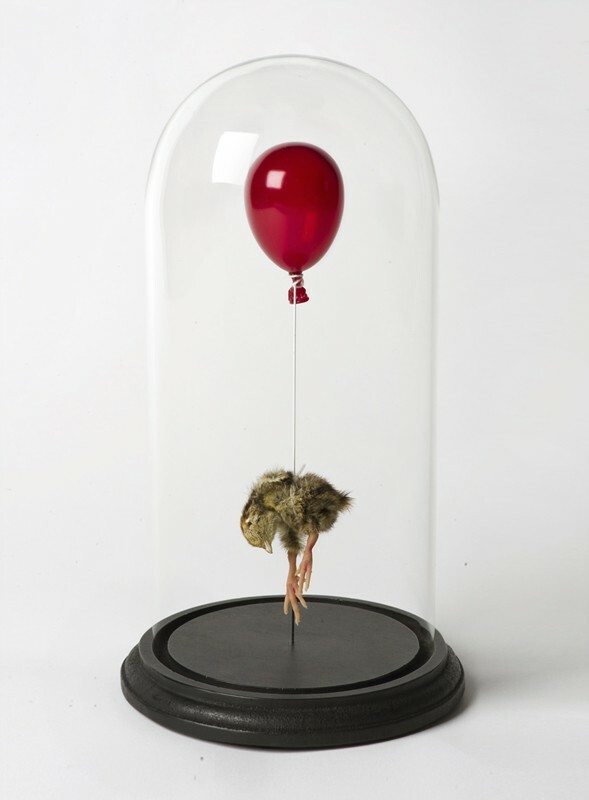 Polly Morgan: Small Still Birth, 2010, taxidermy quail chick, resin-cast balloon, wire, glass, and wood, 25 × 12 cm. Polly Morgan was born in Banbury, Oxfordshire in 1980. Polly Morgan moved to East London to read English Literature in 1998. As an undergraduate she became acquainted with many prominent artists working in the area and, encouraged by their example, took up taxidermy and began making sculptural work in 2004. Having studied with Scottish taxidermist George Jamieson, Morgan began to play with and dismantle taxidermy traditions, creating sculptures that brought her work to the attention of many notable collectors and curators both in Britain and internationally. Polly Morgan continues to live and work in London. See more at http://pollymorgan.co.uk. Victoria Emily Jones lives in the Baltimore, Maryland area of the USA, where she works as an editorial freelancer and blogs at ArtandTheology.org. Her educational background is in journalism, English literature, and music, but her current research focuses on ways in which the visual arts can stimulate renewed theological engagement with the Bible. She is in the process of developing an online biblical art gallery, a selective collection of artworks from all eras that engage with specific texts of scripture.